White w/ Rose Gold Band 7.5" Salad/Dessert Plastic Plates, 10ct. Home»China-like Tableware»Splendor Collection - Silver, Gold, Rose Gold, & Black»White with Rose Gold Band»White w/ Rose Gold Band 7.5" Salad/Dessert Plastic Plates, 10ct. QUALITY: Made of heavyweight food grade hard plastic, our premium plastic party plates are the perfect way to enhance your event! DISPOSABLE WORKS: When the party is over, cleanup is easy - just gather the plates and dispose of it or keep them and reuse it. White w/ Rose Gold Band 10.25" Banquet Plastic Plates, 10ct. 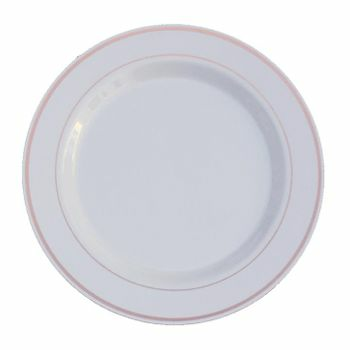 White w/ Rose Gold Band 9" Luncheon Plastic Plates, 10ct. White w/ Rose Gold Band 14oz. Plastic Soup Bowls, 10ct.